2.Sutiable for outoddrs, campr van, portable toilet and any space without water spring. Based in Changhua, Taiwan, is known in the market for our experience of designing, manufacturing and exporting plastic products since 2004. 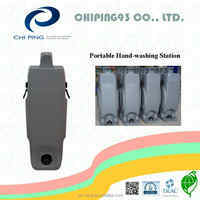 Constantly Innovating is a core value at CHI PING and we have been kept developing the humanized products. Our production line included portable toilet, shower room, urinal, flexible bin, conference table & chair, float for aquaculture……and so on. We are confident in our ability of producing excellent quality products, punctual delivery and superior customer service with respect to OEM / ODM / Customization cooperation. We are building a trustworthy business image, reliable products & quality as well as the our commitment to corprate responsibility for our ever-expanding customer base.